Steal that Technique, and Make it Your Own! know about the wood club head when it was made of the material it was named for?wood? 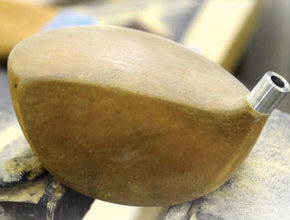 Long before the high school age golfers competing in today’s amateur championships were even born, Honma Golf was making an extremely artistic club using persimmon materials. At that time, every golfer wanted one of these clubs. From the 1970s through the 1980s, a great many professional golfers, active both in Japan and overseas, visited our golf club factory in Tsurumi, Kanagawa Prefecture. The phrase, “If you’ve got a handicap of better than 30, it’s time for Honma clubs” was popular with both the professionals and businessman-golf enthusiasts at that time. In the spring of 1981, 20 new employees joined the Tsurumi Plant to study persimmon club manufacturing. However, there was neither a manual nor any instruction. At that time, there was nobody in the persimmon plant who had time to provide training?everybody was much too busy. The facility handled mainly the molding process. Back then, there were master craftsman at the plant said to be the ones responsible for Honma’s unique style. At that time there were neither club blueprints nor prototypes available, and all there was to rely on was the intuition of the craftsmen doing the molding process. Management would tell the craftsmen what they wanted, and they would immediately craft the head based on an image they had in their minds. If the finished product was comparable to what management wanted, this became the first issue of the product?and the sample product for all of the other craftsmen. Why were Honma’s craftsmen called the “138-ers”? Back then, Honma’s most expensive line of clubs cost \138,000 each. The handful of craftsmen allowed to work on this line were called “138-ers” out of respect--and even envy. Known as the old masters, the craftsmen who earned the title of “138-er” often had their names carved onto the clubs they designed, or went on to establish their own plant later. They were the creators of the “genetic material” of Honma’s original club design. This tradition is perpetuated today by those craftsmen, young at the time, who were inspired by these great old masters. In 1982, four rookies from the club manufacturing division who had just completed their training, including Domon, were posted to the newly built Sakata Plant. They were assigned to the part of the manufacturing process known as “finishing.” Around 20 years old at the time, these craftsmen were suddenly in charge of some 120 part-time employees old enough to be their mothers. The process of finishing is divided into three major stages: polishing, painting, and final polishing. First, the club head, which has already been through the molding process, is polished with fine sandpaper to the point where absolutely no flaws remain. This is done because paint accumulates in any scratches or other flaws, which can cause color irregularity. The head shape resembling contour lines running toward the toe, and in order to maintain its gorgeous design, the piece must be polished ever so delicately, as if to remove the finest of membrane. The inside of the face bordering is coated with lacquer, and then other surfaces besides the face are treated with sealer. Pin holes overlooked in the polishing process are closed up as the piece is treated all over with water putty, a type of adhesive. This ensures beautiful, even color for the paints. Take a moment to imagine how this process, done by some 120 employees twice their age, would be supervised by a small group of young new employees. At times they were timid about saying what had to be said, or their employees overwhelmed them, or they couldn’t get across exactly what they wanted to convey?and the result was that they ended up doing overtime to correct the mistakes of their subordinates for long nights on end. But this wasn’t even the end of the coating process. The stage yet to come was the part of the finishing process that people took the most care with?the real coating process that comes after the priming stages. The slightest change in temperature or humidity will affect the absorption of coatings. The year-round range of temperatures in Sakata is huge. The sea breeze blowing in from the Sea of Japan and the amount of snow accumulation also affect temperatures to a significant degree. Given the idiosyncrasies of each worker who applies coatings, it is a task of extreme difficult to proceed coating one club and still keeps entire set of club in exactly the same color. It is no wonder "Finish performance on actual commercial product" is given a wide berth. To repeatedly coat, dry, and polish clubs. A tremendous amount of work is required here. Our persimmon heads feature a two-tone color scheme. The face of the head corresponds to the natural ground color of persimmon wood as rendered by applying only a clear lacquer coat while the rest of the head is finished in an amber color. The task of extreme difficulty of coating the face lies in the one-shot nature of applying a coat around the edges of the club face. 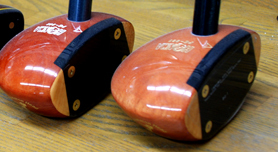 And the difficulty of the coating apart from the club face lies in a uniform coloration techniques to the head as a whole. The head is coated with food coloring. This is dissolved in water at every painting process according to a quantity that is appropriate for the given temperature and humidity levels. Let this liquid soaked into a cloth and gently rubbed across the surface of the head. It is necessary to repeat this process over and over again to prevent an uneven application of the coating, rubbing too much will cause the color to darken excessively. Multiple coating craftsmen are required to always work in complete harmony while checking the absorption condition of the wood they are given each day. The expert coating craftsman will complete his or her work on a club after simply rubbing the head for only three times. At the time of the training, Domon and other craftsmen held the practice head parts which became small by repetition of painting and the abrasion. They just gazed with amazement at what they were seeing. Ladies were relatively more skilled at this process of coating task, which could be due to their familiarity with giving themselves manicure treatments. It is very important task to wipe off the food dye which applied to the transparent face part. 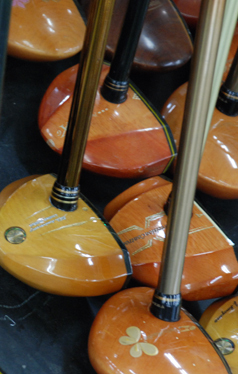 If the persimmon wood absorbs too well, the face of the club will be stained with color. In this case, take a thinly cut glass shard and scrape away the affected part as if you were tearing off a thin piece of paper while taking care to avoid producing an uneven texture. Allow the head to settle for twenty-four hours. The next process is a luster coating referred to as a "clear undercoating". 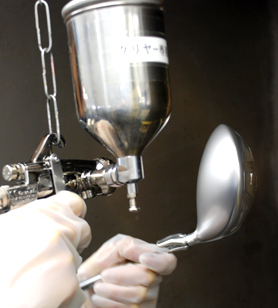 While blowing the whole head with the spray gun filled with clear lacquer, the spray gun must regulate the distance of cancer to the shape of the head to blow it uniformly on applied coatings. Failure to correctly assess absorption and determine the wrong quantity to be sprayed onto the head caused excess lacquer hung down like a lantern (paper lantern) from heads arrayed in carts. Craftsmen who saw these so-called "a lantern" bowed their heads in disappointment. This is a signature for troublesome alteration would be required. Persimmon technology in the modern age. In this way, the application of coatings requires precise work performed with nerves of steel. As for the persimmon heads become light brown in color, their price goes up. This is due to the need for more sophisticated coating techniques as a function of the lightness of the color. Once a clear undercoating and middle coating are applied, neck-grinding work that can only be performed by the expert craftsman. Persimmon heads and shafts were joined with string wound up in a spiral pattern at that time. This work involves grinding down the neck in such a way that light is reflected in a straight line when string is wound around the section linking the shaft to the head. After the shaft is placed in a vise and fix it, the neck is ground down with thinly cut sandpaper while the neck is rotated. If you were to pull the sand paper in a back-and-forth direction, chances are that the part you originally wanted to grind down will be offset to the rear. For this reason, should twist the sandpaper and grind down the surface carefully while adjusting the section which you will make contact with. Since the character of each artisan invariably shines through, the person who ground down a given neck can be identified simply by addressing it. Next is the final finishing process, the step that was regarded as the sacred domain of expert artisans. The surface is rubbed with fine sandpaper as if you were gently rubbing the skin of a baby, after which a single, final coating of clear lacquer is then applied. If the lacquer drips, all the efforts will go to waste. A gleam that was so completely untarnished that one’s face could be seen in reflection of the surface was the standard level required here. In the golden age of the late 1980s, Domon and other 140 people unified the teams and handled 2,000 painting processes per day. The steady advance of persimmon club technology persisted from the 1980s through the early 1990s. In 1985, clubs launched with titanium-boron shafts became a huge hit! In 1991, we launched the LB-280 - featuring a low center of gravity made possible by a short neck - followed by the Big LB-300 - characterized by a head of the large-scale size in 1992. In 1995, saw the unveiling of the Super Big LB, which achieved a low center of gravity while increasing volume through a process of hollowing out the inside of the head after soaking it in a resin bath. Even after other rival companies switched to metal material, Honma Golf continued to focus on persimmon clubs thanks to its superior technology and sizeable fan base. Nevertheless, we were unable to hold out against the trendy flow for much longer. In our factory, workers of the persimmon section gradually transferred to other lines. With the Super Big LB constituting the last of its kind, Honma Golf shuttered its persimmon operations with certain exceptions in late 1990s. "Honma Golf is capable of doing anything in-house basis." A production official with a rival manufacturer once remarked with envy. Domon and others were able to grasp the entire process of making golf clubs and produce clubs from scratch so long as the required materials were made available. The process of applying illustrations to the face is carried out now by affixing mending tape in the shape of the face to the club. However, the original patterns behind these illustrations were drawn by Domon's hand. These illustrations were uploaded to our machinery to enable sticker patterns to be extracted. The manual task of affixing stickers has also been subject to the provision of guidance, based on the kind of intuition by Domon and others cultivated for many years, on how to affix stickers to heads with forms that differ slightly from club to club. This explains why our Honma products are described as having a “good face”. 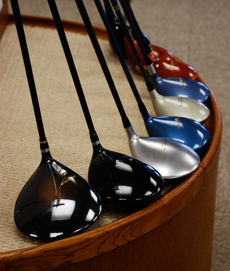 For coatings as well, a wide range of color variations that help to confer luster, depth, a luxurious feel, and more to each club is blended in-house. The number of times coating and baking processes are carried out, thinner adjustments, and baking temperatures are fine-tuned daily to conform to variable temperature and humidity levels. This too as a legacy of the craftsman’s touch that was honed during the persimmon era. Even as the persimmon age gave a way to metal, Domon and others retained their skills and harness them for designing club faces, applying coatings, and filling custom orders. 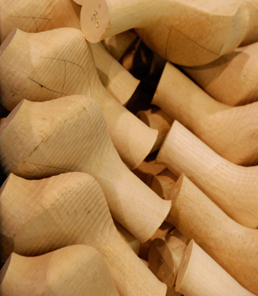 Timeless skills came to radiate with greater brilliance in the context of producing fast-evolving Honma golf clubs. Uncompromising manufacturing is the same in all ages. This side of Domon as captured in his words reflected the true mettle of every last craftsman at the Sakata factory.